Elisabeth Huelskoetter, MD, specializes in obstetrics and gynecology. Dr. Huelskoetter's areas of special interest include preventative medicine, laparoscopic surgeries and 3D/4D ultrasound imaging. Dr. Huelskoetter graduated from Saint Louis University School of Medicine and completed her OB/GYN residency at St. John's Mercy Medical Center. 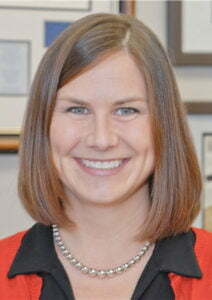 She opened her own OB/GYN practice, Elisabeth Huelskoetter, MD, LLC, on May 1, 2010. Dr. Huelskoetter is board certified and accepting new patients at both her St. Peter's and St. Luke's office locations.